Overall this book is nothing earth shattering or revolutionary. 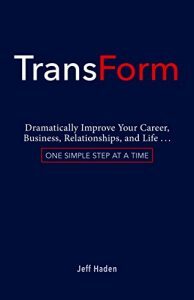 The basic premise is that you CAN transform your life. In all aspects of your life. But the book approaches it from the ‘one small step’ aspect. The transforming is not a grand gesture in a 24 hour period but rather small steps in all areas that make the biggest difference in the long run. Again, nothing revolutionary here, but I found it always good to read/hear items that we all know about but need a good reminder. That is what I think of this book, it’s a good reminder of all the things that transform our lives that we already know about but because of the hustle and bustle of life we forget about. Attacking a Challenge: Instead of whining and lamenting about an ongoing problem, do something different. The author channels Tony Robbins here, stating to pick one of the following things to do differently. Assist: Help someone/a superstar/anyone. It will open your mind to new experiences and you might learn something. Approach: Go opposite. Instead of tweaking your approach, take a different tack entirely. Or just drop one of your goals. No really, just take that off the list. We who are goal oriented sometimes create too many of them. Take one off the list and channel your focus on just a few. You can also change your workday, get up earlier, rearrange your schedule. Something different can ‘transform’ your work habits. Adopt: Here he specifically talks about changing or adopting new habits. The author goes so far as to tell us to emulate others that are doing a good job in their life/career. See what habits they do and mimic them. But he also encourages being the mentor as well. You can learn a lot when you are teaching others. Picking a different hero. Most of us choose to follow or emulate folks we see ourselves in, people we admire because of some trait that we recognize or want to be like. The author suggests a different approach. Find people that are not like you (loud if you are shy, or salesy if you are reserved) and learn more about their approach. How it is different than yours and how you can ‘change it up’. It isn’t comfortable, but it is a learning experience that we can grow from. We can transform into a better version of ourselves. This next thought is about employees and how the business owner thinks of them. The premise is that owners think their employees are only in it for the money. They care about the job but that’s it. But the reality is employees will care about the company if they feel the company CARES about them. And a small pet peeve of mine is that people talk about ‘the company’, when in reality ‘the company’ is really just people. People who do their jobs and make up the company. So if people (the boss of the company) truly care about their employees, then the employees will care about you and the job. No amount of money can make an employee care, but a boss who cares is priceless. In my life, I’ve always tried to take the hard path. I would intentionally sign up for the professor that had the ‘hard’ reputation. I felt that I was there to learn and I wanted the hardest teacher, because I knew I would learn something, not just get an easy A. The author talks about this concept when referring to opening a business. That the easy path to opening a business, one ripe with customers and easy sales, is short lived. As soon as you have success, the competition will be all over it, smelling your success, and will do it cheaper faster and easier than you do. Instead he states, look for the harder path, one with less competition, one that is much harder to earn success but once you do, you’ll have less competition (as most folks won’t work hard) and more long term success. I found that this concept of the harder path also applies to Marketing a business. I can’t tell you how many times I’ve heard and read “gurus” that say ‘just look at your competition and what they are doing and do the same thing!’. This is so frustrating!! Make your own path, be legitimate in your own business, implement your own ideas of what you think will or won’t work. BE a business owner, not a “wanna be like that business owner”. Yes it’s harder, yes it takes more work, yes transforming is accomplished in small incremental steps. 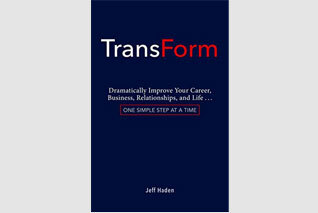 So overall I liked the book, it just was a great reminder of all the ideas and thoughts I think we all already have, just need to be reminded to transform every day!